I just had my DOT physical today as a prerequisite for starting truck driving school and thought I'd write a quick post to let you know what it's like. 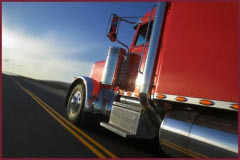 Most CDL training schools and all trucking companies (by federal law) will require you to pass a DOT physical before you start any truck driving job, and then again every two years. For those of you who want to know what's involved with the DOT physical, here's the scoop. Overall, the physical is kind of a joke. I first had to fill out some paperwork and release forms so the medical facility could share the information with my training school. After that, I had a drug test done by way of urinalysis. I'm telling you guys, they don't mess around with drugs or alcohol in this industry. Not only was I drugtested for the physical, but after obtaining my CDL I'll be required to take random drug and alcohol tests. No matter what your views on drug use, drug testing,or drug prohibition are, even marijuana, realize that it's not tolerated at all. If you smoke some marijuana during your home time, that can still make you test positive for the substance even 30 days after you smoked it and long after you're impaired from it. Deal with it. It's just not worth the risk. So if you're getting into this industry, tell yourself right now that you'll never drink and drive or use any illegal drugs. If you can't live without doing those things, find a new career. Anyway, I don't mean to preach or sound mightier than thou. Just use common sense when it comes to drugs and alcohol and there wont be any issues. After the drug test, I took a quick vision exam. Cover right eye, read these lines. Cover left eye, read those lines. Using both eyes, read these lines backwards. Simple enough. Next was a hearing test. They put me in a little sound proof box and had me put on headphones. The headphones broadcast 3 beeps in each ear separately. They are quiet beeps and are at different tones. When you hear the beeps, you push a little button so they know your heard them.They first tested my right ear. Three beeps at a lower tone, three beeps at a middle tone, then three beeps at a higher pitched tone. Then they did the same with the left ear. That was it! Once that was done, they took my blood pressure and checked my heart rate. The doctor came in, checked my breathing, looked in my ears and throat, tested my reflexes, and was done. That's it! There's really nothing to it! And best of all, I didn't even have to take my pants off for the exam! This is the least thorough physical I've ever had, and that includes the physical I had for my office job. Nothing to be worried about. The physical from start to finish literally took about 10 minutes, including filling out the paperwork. If you have any questions that I didn't address, please feel free to email me or leave a comment and I'll answer the best I can. But if you're worried about the physical, just take a deep breath and relax. If you're not drunk, don't do drugs, can see, hear, and breath, you'll pass.